After the pileup of our US stops for the last newsletter, we thought we might try to get ahead on the International leg. However, the events of just our first week abroad have already thrown us well behind. In any case, Internet access may begin to get scarce, so we’ll take a shot at a portrait of the Rousmanieres in New Zealand. As some of you may know, New Zealand has played a very large and pivotal role in Will’s life. 12 years ago, Will’s dad, at a loss as to what to do with his wayward 18 year-old son, had Will deported to New Zealand as a last resort. The rest, as they say, is history. So 12 years later, this seemed the logical first stop on the international leg of our world tour, as it provides a little bit of a comfort zone before we delve into truly strange lands. However, it has been a hell of a homecoming and, at the rate we’ve been going, we may not make it off the island. kiwi blood" and some lovely lamb chops…And maybe along the way we’ve had another lager or 2…or 3. Immense thanks go out to our friend, Chris Bennett, who has been a most generous host while in Auckland and its environs. And it has been wonderful to see Will’s adopted kiwi family again, despite their insistence on telling (what Will insists are mythical) stories about Will’s wild youth down under. Another wonderful element of the trip is that Will’s dad has been here to share it with us. He is in town with the Outdoor life Network covering the Cup, and accompanied us on about half of the events listed above. Not to mention the black tie affair he attended two nights ago, which any of you can probably find on the E! Channel, called the Louis Vuitton Ball. Billed as the New Zealand event of the year, 1200 guests, including Dad, the America’s Cup skippers, and Xena the warrior Princess, were whisked away on a ferry to an undisclosed location for a night of debauchery. Dad hasn’t been the same since. We left him this morning with Dennis Conner, getting in one last interview before DC, as he’s called here, fades into the sunset of Cup elimination. 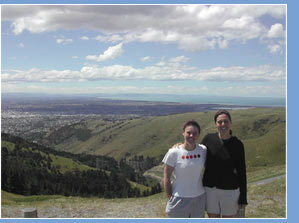 A little worn out by Kiwi city life, today we jump in a car and spend 2 weeks driving down to the South island and back. We will be in the South island for Christmas, and whisked away to an undisclosed location for New Year’s Eve. The next stop is a little unclear at the moment. But it will likely either be Australia or Western Samoa. We will be back on the airwaves over the coming weeks but, just in case, we wish you all safe and loving holidays. And, please be assured that we are doing the same. Copyright © 2003 Will and Dana Rousmaniere. All rights reserved.